Indie label Kool Kat Musik has carved out a solid (if exceedingly tiny) niche as a purveyor of power pop, that oft-maligned subgenre of music which features sharp hooks, strong melodies, and – say its detractors – a slavish lack of originality. 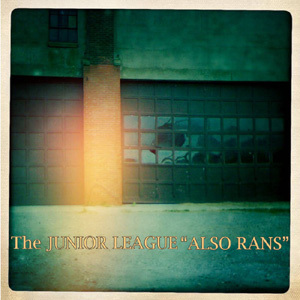 But even listeners who aren’t won over by powerpop’s charms may find “Also Rans” an impressive and original release. Keen listeners may hear subtle country-rock shades of The Byrds, Moby Grape, Buffalo Springfield, and other exponents of that shimmering, jangly electric guitar sound. And The Junior League manages that without the slightest whiff of retro-mindedness. The “band” such as it is largely J. Adragna with able assistance from Scott McCaughey (Young Fresh Fellows, Minus 5). Adragna’s top-notch songwriting and arrangement sometimes recall the very best of 80s rock, as on the hypnotically alluring “On/Off.” Often making evocative use of vocal crosstalk and countermelodies within the context of pop songs, several “Also Rans” tunes evoke memories of very early R.E.M., albeit with a much stronger pop sensibility. Easily a choice for one of my Best-of-2015 albums releases. Available only from Kool Kat Musik. Tell ’em I sent ya.